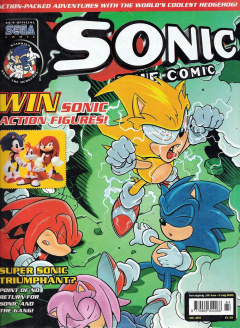 Sonic the Comic #184 is the one-hundred and eighty-fourth issue of the Sonic the Comic series by Fleetway Editions Ltd.
Issue #184 is effectively the last issue of STC to feature any new stories, concluding its adaptation of Sonic Adventure and tying off loose ends. While the comic would continue to be published fortnightly for the next year and a half, the stories would consist solely of repeats from prior issues with only the "Graphic Zone" (and occasionally "Speedlines") segments being new. 1.1 Point of No Return! As Super Sonic continues to absorb the Chaos energy from within Perfect Chaos after hurling himself inside in the last issue, Sonic insists to Ebony that his alter-ego will return to his evil ways, but she has faith that Super Sonic will remain harmless. Sure enough, Super Sonic triumphs over Perfect Chaos, reducing him to his original Drakon form and seemingly retaining his pacifist nature, much to Ebony's delight. However, he quickly reveals that Sonic is completely correct: he has returned to his psychotic self, and proceeds to violently attack everyone in front of him with his eye beams. As the Freedom Fighters get back on their feet, Super Sonic flings the now-harmless Chaos over the wall of the ruined fortress, where he lands in a large pond that Big the Cat is fishing in (marking the fat cat's only appearance in the comic). Before Super Sonic can really let loose, however, Tails strikes the first blow and is blasted away in a fit of rage, much to Sonic's horror. As Tails gets to his feet, Sonic confronts his alter-ego, who is gleefully torturing Knuckles. As both Sonics begin to clash, Grimer is in utter disgust in how Dr. Robotnik had set all of this up just to see everyone (himself included) die at the hands of Chaos and witness how Mobius ends, and straight-up tells the insane dictator that he quits being his servant. As Super Sonic holds Sonic in place, thinking on the many ways of how he can destroy the blue hedgehog, Ebony intervenes by casts a magic spell on the two. This spell appears to destroy Sonic, much to everyone's horror and Super Sonic's delight. Immediately afterwards though, Super Sonic begins to turn blue as Ebony reveals that she merely merged the two hedgehogs back together again. Sonic ultimately wins the struggle over Super Sonic and reassumes his normal form. As Sonic would transform into Super Sonic under times of great stress in the past, Tails asks about what would happen the next time Sonic gets stressed out again, to which the hedgehog responds with "We'll deal with it... We always do! ", as an image of Johnny Lightfoot smiles upon the Freedom Fighters from above. Data Zone: The Data Zone acts as a quick reference guide to new readers about the characters, providing data files on Sonic, Tails, Knuckles, Dr. Robotnik and Grimer. Graphic Zone: Fan art submitted by readers. The theme for this issue's Graphic Zone is "Holiday Fun! ", featuring fan art of Sonic and Tails enjoying the beach. Owners of the printed art each won a Sonic the Hedgehog digital watch. A competition to win Sonic action figures from ReSaurus.